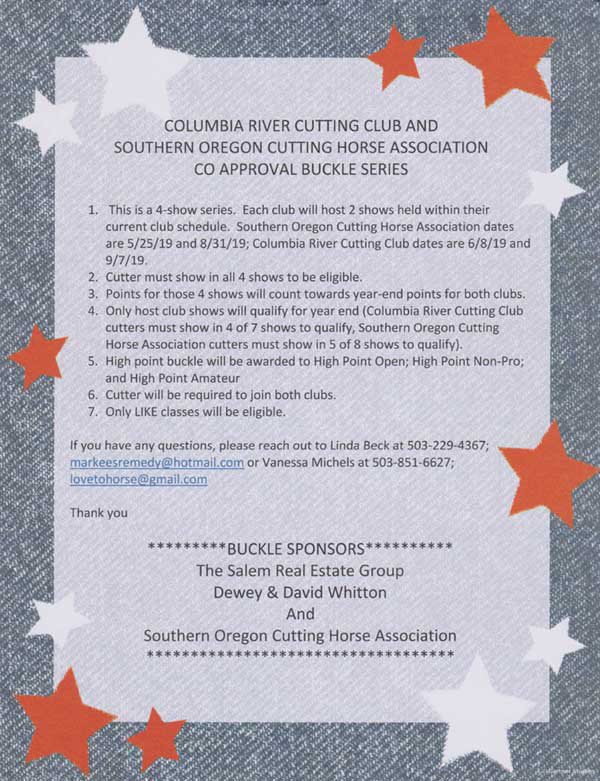 Welcome to the website of the Columbia River Cutting Club! PRESIDENT'S CORNER UPDATE: Click here to meet our new president and read her Presidents Letter. CRCC will be teaming up with NCHA in 2019 and will be participating in the NCHA Challenger Series. This is exciting news for our club as you can earn points and NCHA money. These shows will also allow you to works towards the NCHA Achievement Buckle. CLICK HERE FOR INFORMATION. Please email Linda Beck at markeesremedy@hotmail.com or call Linda Beck at 503-229-4367 if you have questions. Visit the NCHA website for additional information. Please check back as we add new features and updated information. We would like to thank all our Sponsors for helping us make this a very sucessful year without you we could not Make The Cut!